For something on the casual and cool end, you can wear a black leather biker jacket and olive skinny jeans. Complete your look with a pair of red and black suede pumps to kick things up to the next level. You'll be amazed at how extremely easy it is to get dressed like this. 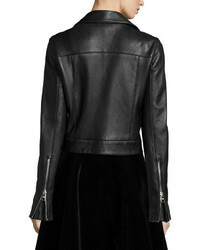 Just a DKNY black leather biker jacket and a black mini skirt. For something more on the elegant side to finish your look, introduce a pair of black leather ankle boots to the equation. This laid-back combo of a black leather biker jacket and black leggings is a lifesaver when you need to look stylish but have zero time to dress up. Amp up the style factor of this getup with a pair of black leather heeled sandals. This casual combo of a DKNY black leather biker jacket and navy skinny jeans is a solid bet when you need to look stylish but have zero time to spare. Take an otherwise mostly casual getup down a dressier path by finishing off with black leather pumps. A DKNY black leather biker jacket and a tan maxi skirt are a combo that every modern girl should have in her casual rotation. Balance this outfit with a dressier kind of footwear, such as this pair of black suede lace-up ankle boots. Why not rock a black leather biker jacket with navy sweatpants? These two pieces are totally comfy and will look incredible teamed together. The whole outfit comes together perfectly when you complement this look with olive low top sneakers. This pairing of a black leather biker jacket and a black pleated midi skirt spells versatility and stylish practicality. If you feel like dressing up, complete this ensemble with a pair of red suede pumps. Extra chic and practical, this combo of a black leather biker jacket and blue boyfriend jeans will provide you with ample styling possibilities. All you need now is a good pair of black leather ballerina shoes to complete your getup. Make a black leather biker jacket and red chinos your outfit choice for a relaxed and fashionable getup. Finishing off with a pair of silver leather oxford shoes is a surefire way to infuse an air of refinement into your ensemble.